If you have recently Jailbreak iOS 11 using Electra Jailbreak Tool, then you will be pleased to know that now you can download and install your favorite Cydia Tweaks and Apps on iOS 11 Firmware for iPhone, iPad, and iPod touch devices. There are many compatible iOS 11 Jailbreak Tweaks and Apps now available on Cydia for Electra Jailbreak Tool. So if you are running the latest iOS 11.4 or iOS 11.3.1 firmware versions on your iOS-Jailbroken devices, then you can search explore those Working iOS 11 Tweaks and Apps on Cydia application right now. Currently, only CoolStar Electra iOS 11 Jailbreak software is available which officially support Cydia Apps and Tweaks on iOS 11 firmware versions. 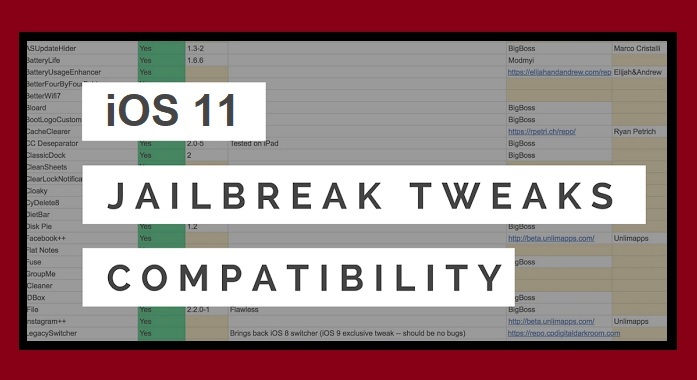 So today, we are listing all those compatible and working Cydia iOS 11 Tweaks and Apps in a live excel spreadsheet for iPhone, iPad, and iPod touch users. Following excel sheet has been developed, compiled, tested, and checked by many iOS-developers and iOS general public users worldwide and all of them have shared their opinion regarding the functionality of all working, not working, partially working, and fully working Cydia iOS 11 Tweaks and Apps for Electra on iOS 11.4 and iOS 11.3.1 Jailbroken devices. Following excel spreadsheet is a Live Report and it updates on daily basis by users. So let's check out the working and compatible iOS 11 Jailbreak Tweaks and Apps on Cydia with Cydia Package ID, Package Name, Package Version, Repo Name, and Status details below.